Note: This is a not an Excel tips post. It is a diary of one of the most awesome conferences I have ever attended. I just finished attending PASS Business Analytics conference in Santa Clara (USA) and am now heading back home to India. And it has been one of the most fun, uplifting and educational experiences of my life. I met so many remarkable people in this trip. Just to name a few, I met Dan Fylstra (one of the pioneers of VisiCalc & founder of Solver), Bob Phillips, Ken Puls, Jordan Goldmeier, Oz Du Soliel, Rick Grantham, Szilvia Juhasz, Zack Baresse, Kevin Jones, Avi Singh, Chris Webb, Rob Collie, Bill Jelen, Scott Senkeresty, Matt Allington, Jon Acampora, Marco Russo & Jen Stirrup. I also felt fortunate to meet many of Chandoo.org fans, followers, customers & supporters who attended the conference. It was non stop fun for 3 days. As if meeting all these great people, sharing a conversation, beer, snack, moment or ride (in a cramped backseat with 2 other Excel MVPs) with them was not enough, I also got to attend few of the amazing sessions at PASS BA. I wish I had the time to attend more sessions. But I was busy teaching a few or meeting people. All in all, in one word, PASS Business Conference has been AWESOME. By then we were 4 people – Ken, Zack, Wessex Bob & myself. We all agreed to head back to rooms, fresh up & meet downstairs in 20 minutes. When we all came down, Jordan was also at the bar area. So we asked him to join us. 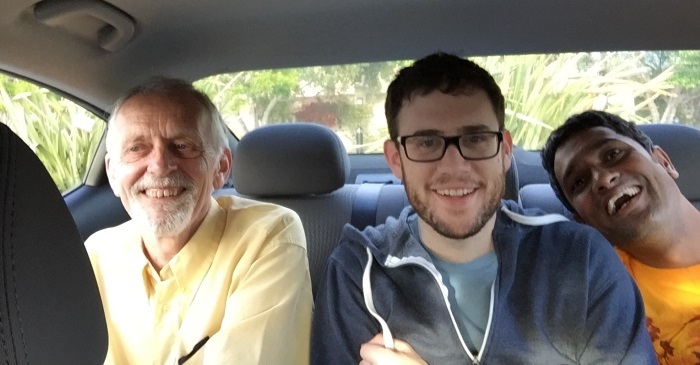 Jordan, Bob & I shared the backseat and lots of laughs all the way to some upscale sea food restaurant in another suburb of San Francisco. Here is a selfies from backseat of Zack’s car. We meet Kevin Jones there and we all share really amazing food, insightful (often hilarious) conversation. As Ken recently quit his job to be self-employed, we all shared our words of wisdom with him. We reached the hotel at 9:30. I find Rob, Scott, Matt, few members from Microsoft Excel & Power BI teams all having drinks at the lobby bar. So I joined them for more laughs, conversation & selfies. By the time I head to my room it was 11:30 PM. 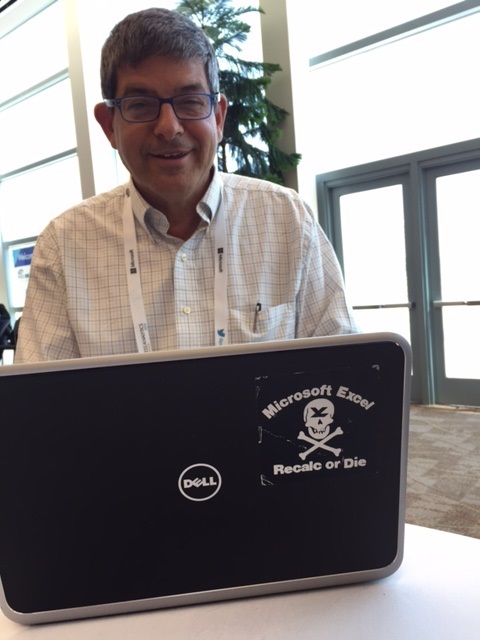 Dany Hoter from Excel team has this cool laptop sticker. 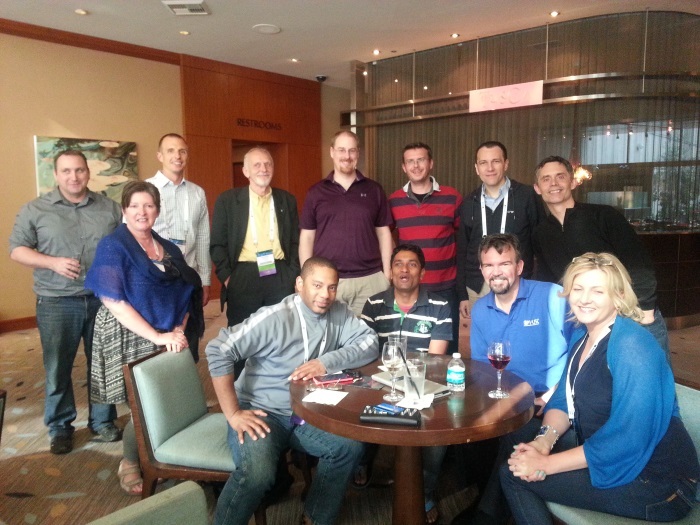 This is the first time I met so many Excel MVPs & bloggers. Here is the first thought that came to me when I saw them. Oz: What a hat! and whats with the Sriracha hot sauce?!? Thanks a lot to the PASS team for inviting me to this conference. I had an awesome time. Also thanks to everyone from Chandoo.org community who signed up for this event & made it even more awesome. Thank you. Are you sure you're not milking this excel thingy? I'd be cow-ering in the company of such individuals - they are indeed the cream of the crop. Glad you all had fun - would love to have been there. It was great meeting everyone. I'm not in that last picture because I was stuck on a hidden column. I met Chandoo. I can finally scratch this off of my bucket list. Great to finally meet you. Big and talks fast. Yep. LOL! It was a real pleasure to meet you, Chandoo! You totally deserved to make this trip, Chandoo. It's people like you that have helped me stay employed at three different jobs and add value to my wife's already awesome skills at her job. How can I make a third or fourth Y-axis to the right of the scatter plot graph in excel? Then add Labels to the series a appropriate. It was great to meet you Chandoo! I agree, that conference was AWESOME! Hope to see you again next year. I hate to read blog, but this was Awesome.. Thanks for posting this, Chandoo. It was such a thrill being in the company of all the best & brightest minds in Excel. Cheers! You do it in a most excellent way, Chandoo; Love it, your excel and blogs on real life story. “Chandoo.org” Really Useful for me.